A delicious savoury dish that will impress family and friends. Oats make a great base for cheesecakes. Calories are a measure of the amount of energy in food and drink. Your weight depends on the balance between how much energy you consume and how much energy you use up. If you eat or drink more than you use you can gain weight. If you don’t eat enough you can lose it. Your body wouldn’t function without fat. Fat is an essential part of a healthy balanced diet. It provides fat soluble vitamins and essential fatty acids. But as fat is a rich source of energy (calories), it can easily contribute to weight gain. On average as a nation it seems we’re consuming too much saturated fat. Eating too much can increase your cholesterol, which is a risk factor for heart disease. Replacing saturated fats with unsaturated fats can help maintain healthy cholesterol levels, and reduce the risk of heart disease. Starchy foods like bread, breakfast cereals or potatoes are a good source of carbohydrate and should make up just over a third of the food you eat. When eaten, carbohydrates are broken down into glucose, which is used to fuel cells in your body like brain and muscle cells. Some people think starchy carbohydrates are fattening, but gram for gram it contains less than half the calories of fat. Choose whole grain or high fibre varieties where you can as they often contain more nutrients. On average in the UK we eat too much sugar. Foods and drinks high in sugars are not needed in the diet. So if you have them, make sure they're infrequent and in small amounts, or you risk tooth decay or obesity. Fibre is classed as a carbohydrate and you should aim to eat 30g fibre each day. Eating plenty of fibre is good for your digestive health and is associated with a lower risk of heart disease, stroke, type 2 diabetes and some cancers. All cells and tissues contain protein, so it’s essential for growth, repair and good health. Protein from animal sources such as meat, fish, eggs and dairy products contain all the essential amino acids (the building blocks of protein) needed by the body. If you're vegetarian or vegan, you can get the protein you need through eating a variety of different plant sources such as pulses, nuts and cereals. A small amount of salt is needed in your diet but too much can raise your blood pressure, which increases risk of health problems such as heart disease and stroke. Adults shouldn’t eat more than about 1 teaspoon (6g) per day – and that includes salt already in the foods you eat, not just the salt you add, so check nutrition labels on food packs. Preheat the oven to 180°C, gas mark 4. Line the base of a 21cm round loose bottomed cake tin with baking parchment. Mix together the oats, 1 beaten egg and cheese and press into the base of the cake tin. Whisk the remaining eggs until thick and creamy. 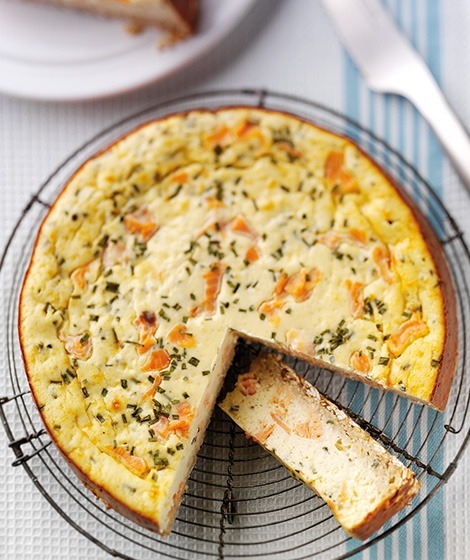 In a separate bowl, whisk the soft cheese and flour and then whisk in the eggs, season. Stir in the salmon and chives and pour into the tin. Ideal served warm with salad but will also be perfect for picnics and packed lunches.